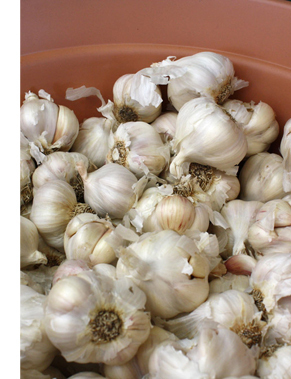 If you love to cook with garlic, but have never tried to grow your own, then there is no time like now to give it a go. Growing garlic is easy and with a little know how this can become one of the many successful crops we can help you to grow this season. Did you realise garlic is a long term crop? Traditionally garlic is planted on the shortest day and harvested on the longest; these dates however are really just a timeline to help us to remember to do so. By planting earlier and harvesting a little later your corms will be a larger size and will still be bursting with juicy goodness. Garlic is easily grown in containers or in the garden, but wherever you grow them it’s essential that they have good drainage. To get the most out of your crop you need to incorporate the correct nutrients at planting time; incorporating plenty of compost into the soil, as well as ‘Bone Flour’ gives a huge boost of calcium and phosphorous, which is specifically good for any kind of bulb or root crop. Dig both compost and bone flour into the root zone at the time of planting, adding 1-2 teaspoons of the bone flour per corm. Use only certified garlic from your garden centre; don’t use those you bought for cooking from the supermarket. #2Briana19/06/201812:53Hi there Margaret, If garlic seems too bitter or strong for your tastes, pre-heating can remove some of its bite. Blanch whole garlic cloves in water for five minutes before slicing or mincing them. Microwaving whole, uncut cloves in a glass bowl for two minutes, or long enough to warm but not cook them, also works. Both methods use heat to deactivate the sulfur released when garlic is cut, eliminating that nasty bite. #1Margaret02/04/201806:12Last season I grew giant garlic and had a great crop but it was so bitter I couldnt eat it. Can you tell me why and what I can do. Thanks.